India became the 35th member of the Missile Technology Control Regime (MTCR) on 27 June 2016. The MTCR is an informal and voluntary association of suppliers of ballistic and cruise missiles capable of delivering Weapons of Mass Destruction (WMD), and other unmanned aerial vehicles. It was established in 1987 with merely seven countries. Though the MTCR does not force any of its members to take ‘legally binding obligations’, in reality, members normally incorporate decisions taken in the informal body. During the Cold War, as more countries joined the MTCR, there were frequent struggles among its members over harmonization. In 1992, the US put India along with a Russian entity sanctions under MTCR for transacting business in cryogenic engines. Though these particular sanctions captured the global limelight, there were many other curbs on India by the MTCR. 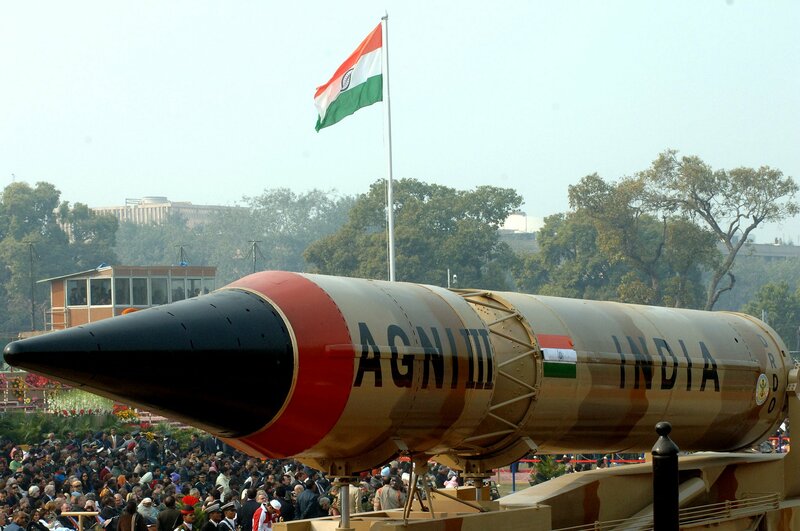 The Agni – III Missile passes through the Rajpath during the 59th Republic Day Parade – 2008, in New Delhi on January 26, 2008. In 1999, the members of the MTCR began a process to draft the International Code of Conduct against Ballistic Missile Proliferation, also known as The Hague Code of Conduct, to counter the threat emanating from ballistic missile proliferation. It was opened for the international community, and India participated in the negotiations process, but did not subscribe to the Code. In recent years, India has set its sight on membership in all the multilateral export control regimes, including the MTCR and Nuclear Suppliers Group (NSG). In 2005, a joint India-US statement effected harmonization between the Indian regulatory system and the MTCR. Efforts were gradually increased, and on 2 June 2016, in the run-up to the MTCR meeting on India’s membership later that month, the Indian government finally issued a press release through which it informed that India had subscribed to The Hague Code of Conduct. At the time of the decision to adhere to the Code, little was known on India’s bid for membership, except that negotiations were ongoing to reach a consensus among MTCR member states. Other than the basic information on their websites, the informal and closed-door meetings of the multilateral regimes have made it difficult for outsiders to obtain details of their deliberations. The indication of a breakthrough on India’s MTCR admission was first made public in a tweet by Ambassador Roald Næss on 6 June 2016. Ambassador Næss, who acted as Chair of the MTCR in 2014-15, tweeted: ‘Mission almost accomplished. Only some procedural formalities remain before India becomes member of MTCR’. The completion of all the formal procedures for membership resulted in the 27 June announcement on India’s MTCR admission. The announcement was a welcome relief for Indian bureaucrats who were already under heavy pressure due to the failure of India’s NSG membership bid in the 23-24 June NSG plenary meeting. On the one hand, the MTCR announcement diverted the Indian media attention away from the NSG rejection while on the other, it sparked a sudden interest in India on the costs, benefits and general implications of MTCR membership. What is the significance of India’s MTCR membership? The Indian subscription to The Hague Code of Conduct has already contributed to the process to curb ballistic missile proliferation. Importantly, MTCR membership has made India a partner in the international struggle against proliferation of WMD missile technology. In fact, the country has been gradually integrating itself with the multilateral export control regimes in particular and the non-proliferation regime in general. India achieved its membership only after all the MTCR members considered India’s credentials for supporting international non-proliferation exercises. The process toward India’s MTCR membership has been a unique journey towards a common understanding between the MTCR members and Indian policymakers. During that journey, India has evolved a strong legal, regulatory and enforcement infrastructure to regulate export of missiles and missile technology. India’s MTCR membership ensures that India’s regulatory system will be continuously updated with the changes in MTCR guidelines and new technology. For instance, India’s academic community and industry are capable of designing and manufacturing different types of drones and unmanned aerial vehicles. As viewed by the MTCR, the proliferation of drones is potentially destabilizing. Indian innovators and industry have developed capabilities to design and manufacture items listed under both MTCR categories. Whereas weapons systems such as ballistic missiles and cruise missiles are manufactured by state owned companies, a large number of dual use items are manufactured by the private sector. Large, medium, small and micro enterprises are manufacturing dual use items that can be used for development of missiles capable of destabilizing the international system. Indian authorities may deny license to a company to supply any entity if any other MTCR member has done so to an end user or recipient. Under the MTCR, export of category I items such as ballistic missiles, cruise missiles and target drones is a matter of ‘an unconditional strong presumption of denial regardless of the purpose of the export.’ This means that export of such an item should be allowed in the rarest of rare situations. Otherwise, license for such an export is to be denied by the government. The MTCR makes it clear that business in production facilities for category I items is completely disallowed. On the surface, it may appear that the category II of the MTCR annex or list allows greater flexibility in transfer, but the regime expects its members to exercise their prudence in determining whether the transaction or transfer will contribute to proliferation or not. Membership in the regime brings a greater responsibility on member countries regarding control or regulation of category II items. Discussions in different meetings and forums of the MTCR regarding threat perceptions and sharing of information on recipients will add greater clarity to the Indian licensing authority. According to MTCR guidelines: ‘Partners are bound by a “no-undercut” policy to consult each other before considering exporting an item on the list that has been notified as denied by another Partner pursuant to the MTCR Guidelines’. India can contribute immensely to promoting the ‘no undercut policy’ of the MTCR. Otherwise, too, MTCR guidelines will be highly useful for controlling export of missile relevant goods designed and manufactured by India’s missile industry. In sum, India’s MTCR membership and the process through which it joined will be positive for international stability and peace. A former critic of the MTCR is its partner now. Similar regimes like the NSG may draw lessons from the MTCR experience with India. Benefits of India’s membership overshadow the minor obstacle member states have to overcome. Global peace and stability will definitely be benefited when a potential high-technology supplier like India is accepted as a member of the multilateral export controls regimes.